“With us both being married to ‘Mumbler mums’ Jo and I are used to having to make sacrifices for the great good of Mumbler. And so once again, we graciously gave up what we feel is the highlight of our week, (looking after our kids on a Saturday afternoon) to go off and review a snowboarding experience. Obviously it was a huge grind but that just the kind of guys we are, always willing to go the distance for others……..
Ok, I realise no-one is going to believe that so let’s just say we said yes quicker than you can say ‘apres ski’ when our wives asked us if we fancied going off on our own for the day to visit Chill Factore (the UK’s longest indoor real snow slope) in Manchester. So here’s our thoughts on the experience…..
Firstly, getting there. It’s based at the Trafford Centre so it doesn’t matter where you are coming from, make sure you allow plenty of time to get there and by that, I mean anticipate traffic getting from the M60 into Trafford Park itself. We were told to be there 45 minutes before our lesson started so I planned our route accordingly but because it took us so long to do the last couple of miles we only got there 15 minutes before we were due to start. Fortunately, it wasn’t a problem as from the moment we arrived, it was clear that they are running a well-oiled machine. Whilst there was a small queue at check in, there were staff on hand walking the queue to see if we already had a booking in which case we were taken straight through to where you get your clothing. From our experience, all staff were hugely friendly and helpful. No grunting teenagers here! In terms of gear, if you are like Jo and take your skiing seriously then you can of course take your own gear. Not knowing the score beforehand I’d borrowed some of his spare gear. However, the majority of people who use the facilities don’t tend to own ski gear so your booking includes a set of salopettes (ski trousers), a ski jacket, and a decent pair of thermal gloves which you get to keep which I thought was a nice touch (no pun intended). There looked to plenty of sizes and they cater for children of all ages. Obviously good clothing is important because out on the slopes it’s -5°C. Speaking to the other students in my group, I can confirm that the provided clothing kept them nice and toastie for the duration of the session. What I also really liked was the fact that the instructors were using the same kit as the students, even down to their snowboards and skis. As soon as you get your clothes issued, you are signposted through to the changing area where there are plenty of private cubicles. We also noted that there were also group changing facilities (which I assume you can use as a family). Once changed you can then store your personal clothes in lockers which require a £1 coin (refunded when you unlock it). These are big enough to store kit for two people so Jo and I both managed to get all of our kit into a single locker. Following a quick toilet trip (loos were very clean and I noted both disabled and baby changing facilities) we went off to the equipment area. If you are snowboarding then it’s a very straightforward affair – you just need your shoe size and an indication of your leading foot to determine what size of boots you require. If you are skiing then it’s just a couple of extra measurements to work out what length of skis you need. Once ready we were sent over to a numbered bay where we were able to sit down on benches to await our instructor. It all felt very smooth and well organized. From arriving to being ready to go it took around 25 minutes but I’d imagine with a couple of kids this would take more like 40 minutes; hence why they ask you to arrive 45 minutes before your session begins. Our instructor for the day was a guy called Danny and he looked and sounded exactly like you would expect (and want) from a snowboard instructor. Think a Mancunian version of the Turtle from Finding Nemo! Danny is a total dude, very easy going, taking the time to learn each of our names and making us all feeling at ease. What made him a great instructor in my view was not only the structured way he delivered the session, (taking into account each individual’s natural abilities and reason for wanting to try snowboarding,) but it was clear from the start that he had a real passion for the sport. Danny explained that he has been a snowboarder for 12 years, having spent the last 6 years teaching it in Japan, Canada, and the US. What was nice was a little speech he gave at the end of the session about what snowboarding meant to him. It wasn’t a sales pitch trying to encourage people to come back for more, just an overview of what part it’s played in his life and how he feels it can benefit people. He even told us that he’s now got his 3 year old son into it! Our group of 8 was made up of people who varied in age, physical confidence, and natural ability. For example, whilst Jo’s somewhat of a skiing-pro having been doing it for 30 years and has some previous experience of snowboarding, I myself have only been skiing twice (where both trips I spent more time in the bar than I did on the slopes!) and have never done snowboarding so I was very much the novice. We also had people in our group who had never set foot on a ski slope before. Danny’s work was cut out but he handled it really well and made it fun for everyone in a patient and non-patronising way. The session lasted around an hour which absolutely flew by, with Danny delivering it in a very progressive and methodical way including an introduction to the equipment along with skills such as sliding on the flat before climbing up and sliding down a small section of the slope. It was pretty basic but this was known as the Snowboard Fun Taster which did it’s job of leaving me wanting more. And this is where the Snowboard Progress Card comes in. Issued to you at the end of the taster session this record of your learning shows you the various steps to becoming a snowboarding god from beginner level 1 to 3 on the beginner slope, through Improver level 4 to 6 on the main slope, to Development level 7 to 9. It was all a lot of fun and I would say that the best way to get the most out of it whilst speeding up your progress would be to do a session in the morning with a break for lunch followed by another session in the afternoon. Around our session it was clear that kids of all ages are well catered for. As well as the main slope (which is huge and features a ‘button drag’ style ski lift) the beginner slope (which is shorter and less steep featuring a ‘magic carpet’ style ski lift) was full of children from toddlers to teenagers learning to ski (and doing a lot better job at it then I ever did!). With crash mats in place at the bottom of the slope and good instructor to student ratios it all felt very safe in a fun way. Away from skiing and snowboarding there were toboggan runs for children and adults (which looked a right laugh), a children’s play area in the snow (Mini Moose Land for children and toddlers under 4 years old), and for those who just wanted to watch the fun from a distance (grandparents for example), a really good viewing balcony which is free to use. 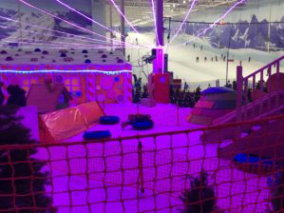 Off the slopes there is also a climbing wall, free ping-pong tables, and around Christmas a Santa’s Grotto for the little ones (although I think you have to book this in advance). All this activity leads to empty tummies so fortunately there is a variety of restaurants and café’s onsite including a Sports Bar (with live sport on the TVs), a Wetherspoons, ice-cream and pizza shacks, and of course, the ever popular Nando’s. Upstairs there is a really cool area which as well as an Alpine style café called Mont Blanc also features a private room called ‘The Eiger’ which looked perfect for kids birthday parties or group / team events. 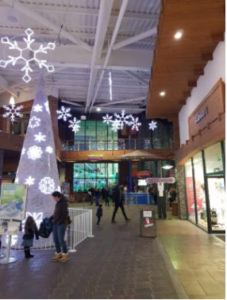 There is also a good selection of shops including ski and walking gear (Snow & Rock and Subvert), Crystal Ski Holidays (if want to take your skiing seriously and book a holiday through a specialist ski travel agent) and a fitness and sporting goods shop. Pricing wise, it’s best to check the website directly as it all depends on your individual needs. Speaking to the guy at the front desk they offer all sorts of schemes which change over the year to cater for group rates, kids parties, individuals or family packages, ongoing loyalty and discount packages, etc. To put it in context, our Snowboarding fun taster session would costs £30 per adult (£27 off peak) and lasts for just under an hour so whilst it’s not the cheapest activity you can do I found it very rewarding and a lot of fun. All in all it’s a great day out either as a couple of mates or a fantastic treat for the family. Given that you can buy vouchers for lessons it might also make a fantastic Christmas present! 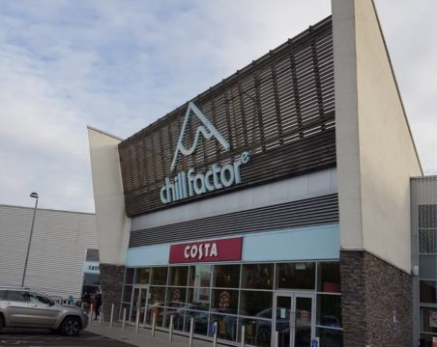 Disclosure: Chill Factore did provide the Mr Mumblers’ with a free session each for the purposes of this review. The opinions that Mr Mumbler has expressed here is his own and he has decided that he would like to offer his review services to all “Dad” type products and reviews, particularly those which involve beer and days out with mates….